Several weeks ago, Williams-Sonoma approached me to collaborate on a post about juicing recipes. I thought it sounded fun and decided to jump back on the juicing train. (I'm hot and cold with juicing. Mostly because my kitchen is tiny and I don't really have space to leave the juicer up on the counter at all times. And as the saying goes, out of sight, out of mind.) 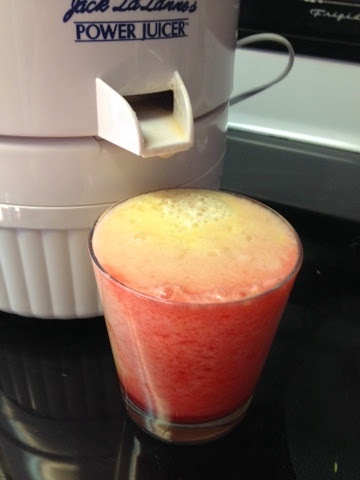 So I pulled my juicer back out of the closet and decided to get creative with tasty ingredients. My first idea was to make a savory juice. Something that could be enjoyed fresh from the juicer but could also be heated into a comforting soup on a cold fall day. I also wanted this juice to be entirely homegrown from my very own garden. 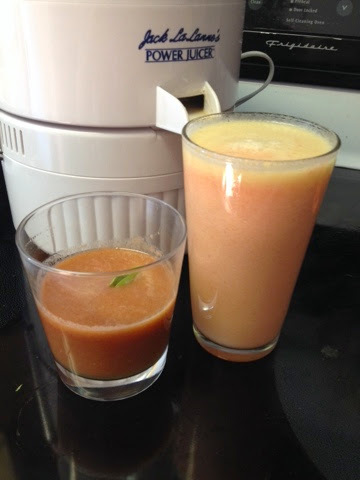 I wanted to highlight that juicing can done for pennies (growing plants from seeds is incredibly inexpensive) and can be enjoyed outside of a sweet breakfast treat. I grew and harvested all of the ingredients in the following recipe. 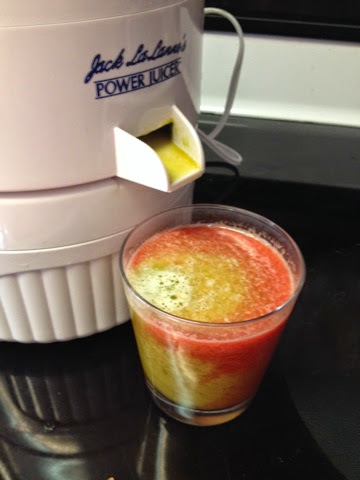 * When I juice leafy greens, I place them in the juicer under something heavier like the tomatoes to ensure they get juiced. * Run all of your veggies through the juicer. Stir with a spoon and enjoy. * To turn it from juice to soup, heat in microwave. Add salt and pepper if desired (I didn't think it needed it though). So delicious! I will use this recipe over and over again- both chilled and heated as a soup. It's a keeper for sure! My second idea was to make a delightful sweet juice that tasted like fall. 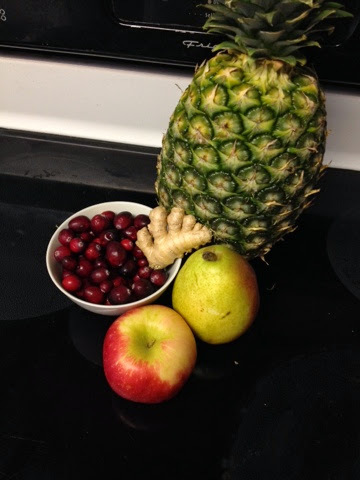 I decided to use fresh cranberries and ginger to really bring out that special fall flavor. Pineapple happened to be on sale. It's certainly not seasonal or local, I fully admit. But I decided that it might be a fun flavor combination to add to the mix. * Start with the smaller fruits (cranberries and ginger). Juice all ingredients. Stir with spoon to combine. * Enjoy as is or combine with sparkling water for a fresh, fizzy treat. Yum! This juice not only looked stunning, but also tasted incredible too! If you are not a big ginger lover, add only a tiny amount. I can't get enough ginger though so I added quite a bit. As Sheldon Cooper would say, it's zingy! * Juice fruit. Add ice. Call it desert! Do you even need a review? Of course it's amazing! This came about because I had extra ingredients sitting right there. It's definitely a sweet treat though. Mmmm good! I had a lot of fun with this post. 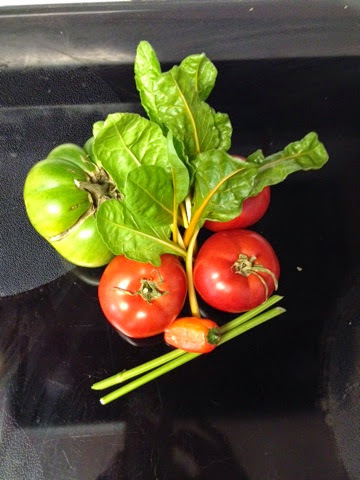 I really wanted to make one recipe entirely from my garden, even though it's the tail end of the season (we're expecting snow flakes this coming weekend...so I should probably come to terms with garden season actually being over). And I really wanted a second recipe that tasted like a fall treat. I feel like I accomplished both of my goals, as well as reminded myself how much I really do love juicing. It's so amazing to get a huge quantity of fresh fruits and vegetables into your body with very little effort. Williams-Sonoma has a huge selection of great juicers and juicing tools if you don't have one you're in love with already. While I do like my juicer, WS has the best of the best to pick from (and many are currently on sale!). And as an added bonus, I saved all of the pulp and waste to add to my garden compost. Nothing goes to waste! I know some of y'all juice regularly too. Do you have any fall favorite recipes to share? Have you ever made a savory juice and turned it into a soup? Pretty sure those first two recipes are going to be replicated by me this holiday season! They sound delicious and refreshing. Thank you for sharing them!